Look, no hands. The bus that knows its way around La Rochelle’s harbour side, without a driver. A House of Lords report on self driving vehicles (“Connected and autonomous vehicles: the future”) led the BBC Radio 5 morning news bulletin today (Mar 15, 2017). The advance of this CAV technology over the past five or six years has been phenomenal, and it’s hard to see what could prevent it from dominating the transport around us well before the middle of this century. Autonomous driving technology is maturing very quickly, with so many companies developing different ways to make cars smart, through deep learning, and reinforcement learning, as well as conventional programming. In reinforcement learning the vehicle’s IT system actually teaches itself. The software behind the cars’ behaviour isn’t programmed to deal with specific hazards and challenges. Instead it learns, for example, how to merge, slickly and safely, through virtual practice. On the way to embracing this change there will be roadblocks, safety concerns, regulatory setbacks and checks from the deep-seated cultural antipathy among not just the petrol heads, but the many people who derive genuine satisfaction from conducting a car from one point to another, and just like to be control. However the potential benefits are so enormous, in reduction of road accidents and casualties, the enormous insurance savings, and increased mobility for people who never learnt to drive, or are too old or infirm or cautious to drive, that the advance of autonomous vehicles will be irresistible. The really big developments are likely to come in the 2020s. Until then most of us will experience self driving vehicles in little, restricted trials in cities involving autonomous buses like the one I tried out in the French city of La Rochelle in 2015. There were further trials in San Sebastian (Spain), Lausanne (Switzerland), and Trikala (Greece). The programme ended in 2016. The organisers, the EU-supported CityMobil2 says it was successful and you can read about it here. This is my account of my first journey in a road vehicle without a driver, when the bus was on trial in La Rochelle in 2015. I am on a little bus with no apparent front or back, trundling around the harbour area of La Rochelle in western France. Few people take notice. The big point of interest here is a full-size working replica of the Hermione, moored at the quay. This is the 18th-century ship that took the French General Lafayette to America to help defeat the British in the War of Independence. Those who do will be intrigued to see that our little bus, the Cybercar, has no driver. Yet it is negotiating the twists and turns of the road around the dockside and past the University with no difficulty. It isn’t going very fast, about 7 to 10 km/h, but it will unerringly do what it has to do if, for example, a boy chases out after a football, within 2 m of the bus. It will stop dead. On this rainy morning the only person aboard with me is an attendant who was there for safety purposes. It’s clear we could have done the trip without him. Guided by sensors, and what the on-board computer already knows about the route, the battery-operated bus obeys a green light to cross at a junction, fits through a narrow gap between two bollards, and it comes to a precise halt at bus stops. Robotic vehicles have been fetching and carrying things on factory floors for some time. Underground trains and trams have been operating without drivers for years. So is there anything so remarkable about a bus travelling around under a computer’s instructions? There certainly is. The technology behind autonomous cars is now so advanced that one has just driven across the USA without a human at the wheel (March 2015). But few people will get to (not) drive one of those vehicles for perhaps 10 or 15 years, and they may still be expensive premium products even then. Buses, on the other hand, are in our towns and cities and villages, and available to all of us to use. The people directing this EU-funded project see the first application of these indefatigable little driver-less vehicles on short distance feeder services, taking passengers to existing bus stops and railway stations. There will be more trials, more technological improvement and legal and public safety obstacles to be crossed before the next generation of autonomous buses can go into regular service, but it seems inevitable that we reach that point within not too many years. 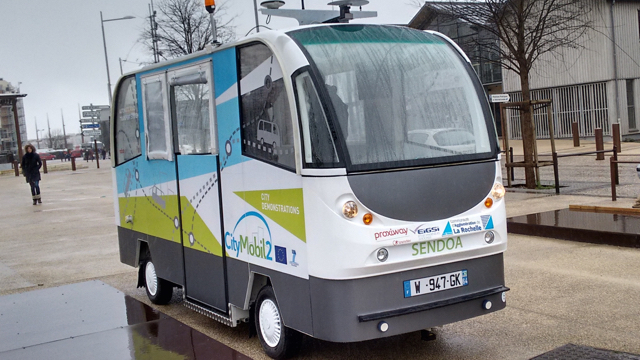 La Rochelle is the first largish town trialling automated road public transport systems in the EU CityMobil2pilot programme. The electric buses, literally indefatigable, started plying this route in December 2014. Six other European towns and cities will shortly follow in demonstrating automated public transport. The second city demonstration will happen during the 2015 World Exhibition in Milan, from May until November 2015. More trials are scheduled for Lausanne in Switzerland, the Italian town of Oristano in Sardinia, and Vantaa, Finland. The six Cybercars being tested in La Rochelle are made by French company Robosoft. They are conventional electric minibuses, with room for 12 people, converted to be fully automated. Their maximum speed is 45 km/h, although they are limited to 7 to 10 km/h in the trials. Studies suggest that buses based on automation are particularly suitable in providing feeder service to the main public transport network. Anyone who lives, say, a mile or two from the nearest railway station, where the car park is very often full, and expensive even if there’s space, will see the benefit of this little roving self-driving bus. You could order it via your smart phone for a pickup from your doorstep, to deliver you and perhaps six or 10 others who live close by, in good time for the 7.26. Let it know, and it’ll be at the station to take you home in the evening. The programme is being funded by the EU’s Seventh Framework Programme for research and technological development. www.citymobil2.com. La Rochelle (146 362 inhabitants in the metropolitan area), in the Poitou-Charentes region, has been a leader in green urban initiatives for 40 years. It was the first town in France to pedestrianise its centre (1973) and to introduce a public bike scheme (1976). The city promotes clean transport, in particular through electric vehicles.